Good day, everybody! Here is hoping you’re doing well on the penultimate day of winter! Today’s reveal was just amazing, as there are circles at the beginning of each of the five theme entries. When filled, the circles spell out C-SPAN, the public service channel that covers the ins and outs of our United States Congress. Furthermore, each of the first words in the theme entries is what each of the letters of “C-SPAN” stand for, Cable-Satellite Public Affairs Network. Oh, and March 19, 1979 was the day that C-SPAN first launched, making today the 40th anniversary of the network. That’s anything but a bore, which a lot of people think the network is. Tore through this grid without having an idea of what was happening with the circles, and that made the reveal even tougher to see when I had put in “evening news” instead of NETWORK NEWS. After untangling that, that’s when the a-ha moment happened. After solving today’s grid, many people now will know both I, TINA and I, TONYA (48D: [2017 biopic starring Margot Robbie as figure skater Harding]). Here’s guessing that the latter won’t take off and be a crosswordese staple in many published grids to come like the former. Definitely had a trip down memory lane seeing one of my old stomping grounds, The OZARKS, in the grid, especially since it referenced the state I was living in when seeing the range, Misery…err, Missouri (2D: [Missouri mountains]). Just kidding, folks, especially those in the Show Me State. Love me some MO, even if I haven’t been back there in about 15 years. MODERATO was definitely new to me, as music terminology will never be a strong suit for me (11D: [Tempo that’s neither fast not slow]). 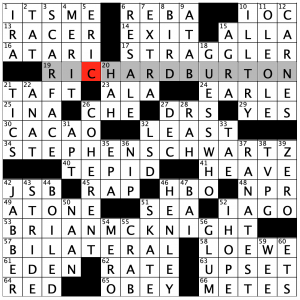 It’s sports time, and though I could bring up former college football head coach Gary NORD, who was the head coach of a school, from 2000 through 2003, that’s popular in crosswords, UTEP, I went in another direction (28A: [North of Normandy]). “Sports will make you smarter” moment of the day: NEN (65D: [Three-time All-Star pitcher Robb]) – One of the top relievers in the 1900s and the early part of the 2000s, Robb Nen recorded 314 career saves, most of them coming as either a member of the Florida Marlins or the San Francisco Giants. Nen was a part of the Marlins’ team that won the World Series in 1997 and was the closer of the San Francisco Giants team that went to — and should have won, in my opinion — the 2002 World Series against the Anaheim Angels. While a member of the Giants, and because of his role as the pitcher who came on to record the final three outs of a game, some San Francisco fans (notably, my college roommate who was born and raised in SF) nicknamed the ninth inning “The Nen-th Inning.” Oh, and any time he came in the game during a game played in San Francisco, his walk-out music was Deep Purple’s “Smoke on the Water,” which gives me the green light to embed that amazing song on here! Enjoy! 17A: TRACK BALL [Follow a 1950s TV superstar?] – I Love Lucy! 47A: TRAIL MIX [Follow a silent-film cowboy?] – This apparently refers to Tom Mix. Who? A consistent, clear theme that worked well. Each theme entry is following the clues to a celebrity via some kind of following action – track, dog, trail, and tail. I was pleased that stalk or any of its synonyms weren’t included – that’d have given this puzzle a creepier vibe. Only have two 9-letter themers and two 8-letter themers certainly makes for a light theme set, but I’d rather that than a puzzle jampacked with themers and less ideal fill. Speaking of less ideal fill: FAT FARM. If it’s in your lists, cross it off. It comes across as cute, but it’s mean and hurtful, especially when you think of kids in these contexts. No lifelong body issues will be cemented there. Nope, not at all. What I did appreciate was the representation of women in this puzzle: Lucile BALL, MAMA, ADA, Whoopi/CELIE, and Lady GAGA. Not a ton of entries, but more than most puzzles so … yay? Yay. I also liked these other entries: KITSCH, XERS, and TOE TAG (though morbid). That’s all for now – see some of you at ACPT this weekend! 18a. [Simple, simple, simple [1,2,3]], EASY AS ABC. 19a. [Half of the rap duo Black Star [4,5,6]], MOS DEF. 27a. [Prefight ritual [7,8,9]], WEIGH-IN. 42a. 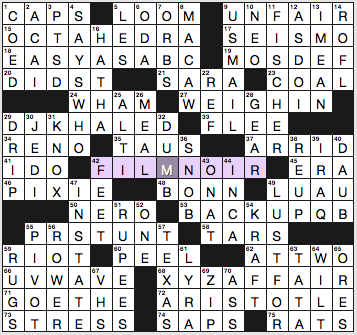 [Dark movie genre [12,13,14,15]], FILM NOIR. Four in a row! 53a. [Substitute for Tom Brady or Aaron Rodgers, informally [16,17]], BACKUP QB. 55a. [Silly marketing ploy designed to get attention [18,19,20]], PR STUNT. It’s inelegant that the U happens to follow T here, but is thematically included in the next one. 68a. [Diplomatic controversy of the 1790s [24,25,26]], XYZ AFFAIR. Not a perfect execution of the theme concept, but pretty good. Besides the DJ Khaled clue, there was another error in the puzzle. 5a. [Weaver’s devices], LOOM. Well, that’s careless. A plural clue for a singular answer, at least in the .puz file. 44d. [Ancient speakers of Quechua], INCA. And the current speakers of Quechua are living mostly in Peru, Bolivia, and neighboring countries. Yeah, I didn’t know any of this. I may have read about Burton never winning, but I don’t follow the Tonys that closely, and I didn’t realize McKnight hasn’t won. I thought he was part of a group at some point, but that was a family member who was in the group Take 6. All in all, a puzzle should teach you something, and this puzzle definitely fits that bill. 4.3 stars this week. 6A [Sitcom set in suburban Houston] REBA – I haven’t seen this show in years. Is it still on in syndication somewhere? Is there still a country music cable channel? 17A [Late arrival] STRAGGLER – According to xwordinfo.com, this entry has only ONE Shortz era occurrence. I am highlighting it because I don’t remember seeing it in a puzzle before. But I have seen it at least once! 24A [“Watchmen” actor Jackie ___ Haley] EARLE – I remember this actor from The Bad News Bears from waaaaay back in 1976! There were also a couple of related sequels just after ’76. He was a lot younger then; Wikipedia shows he will turn 58 in July. 5D [“Tim and ___ Awesome Show, Great Job!”] ERIC – This definitely fits the bill for the obscure-pop-culture-reference-of-the-week. This was apparently an Adult Swim feature a few years ago? I don’t know this at all. 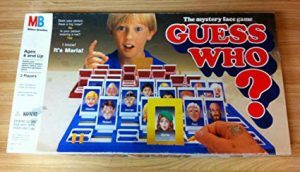 18D [Milton Bradley game featuring facial features] GUESS WHO? – Wasn’t this a ’70s band as well? Yeah, I know the board game better, too! 26D [Intelligible] COHERENT – Or [Unlike Trump’s tweets]. Oops: did I just get political for a second? The news cycle is making fun of his recent weekend Twitter rant. 37D [Did some diagnostic work, maybe] RAN A TEST – This has zero NYT hits. I think this is a fine entry. Speaking of Twitter, there was a thread I was recently reading talking about crosswordiness of certain entries (specifically AIDY Bryant from SNL in this case) by their NYT frequency. I think NYT is used because people have gone through the difficulty of tracking the NYT puzzles. 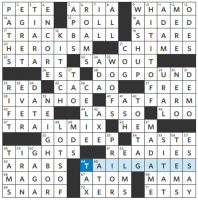 If there was another database for other puzzles, I am interested, but I know the NYT project has taken several people literally years and years to produce. 47D [“The Crow” actress ___ Ling] BAI – There cannot be many ways to clue this! 54D [“Desus & ___” (2019 late-night Showtime TV show)] MERO – I have actually heard of this show! I have never seen it, but I know who these guys are!! That is all for this week’s Jonesin’! I thought this was neat. Yes, we are all familiar with a stage show, a craft show, an air show and a slideshow. Gail and Bruce have definitely “put on a show!” Sometimes I think i am too nice a blogger, but I am in a good mood since the ACPT is this week! Hope to see a lot of you in a few days! Regardless, this is still a very clean puzzle. A solid 4.5 for today’s LAT. 28A [Stars and Stripes squad] TEAM USA – Where is the Team USA Cricket team?? 30A [Soup spheres] PEAS – Awfully small spheres, here! Did you know you might get peas on the side if you order fish & chips in an English pub in the UK? 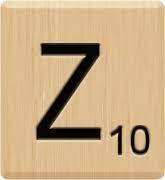 64A [Scrabble 10-pointer] Z-TILE – I love Scrabble, but I just have no time to play. Perhaps when I retire!! 4D [Faux ally] FRENEMY – This is a great entry. 23D [Messing of “Will & Grace”] DEBRA – I see this show is back in production, proving sometimes that the old standards usually work. Having said that, I don’t watch sitcoms! 26D [Lexi Thompson’s sports org.] LPGA – According to her Wikipedia page, she played in the US Open at age 12! She is also quite tall according to this page, standing a full 6’0″, which is slightly taller than I am! 33D [Amazon Echo’s assistant] ALEXA – I have said it before, and I will say it again: I do NOT want one of these! What’s the theme? Who nose! 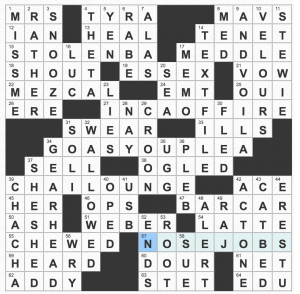 THEME: NOSE JOBS- or parsed differently- NO “SE” JOBS. 15A [Illicitly procured college degree?] STOLEN B.A. The base phrase is STOLEN BASE. 27A [Ancient Peruvian sun god?] INCA OF FIRE. IN CASE OF FIRE. 34A [Copycat’s entreaty before a costume party?] GO AS YOU PLEA. Instead of GO AS YOU PLEASE. 39A [Place to relax with Indian tea?] CHAI LOUNGE… though you could relax better there if it also happened to have a CHAISE LOUNGE. 57A [Cosmetic surgeries that, read differently, are performed on the starred answers] NOSE JOBS. Didn’t get the theme until the revealer- and even then balked for a couple seconds. Probably because the clue for it was a bit clunky. It seems to say that NO “SE” JOBS are performed on the theme answers, but I’m still not fully understanding how that makes sense. I mean, I get that SE is missing from the base phrases- but how does one perform NO JOB in any context? Took me about 3 minutes longer than average. Felt like there was more bite to it than the average Universal (not a complaint at all). Fun diversion after a stressful day, though. And isn’t that what we’re looking for? This entry was posted in Daily Puzzles and tagged Andrew Zhou, Bruce Venzke, Daniel Larsen, Elizabeth C. Gorski, Gail Grabowski, Gary Larson, Matt Jones. Bookmark the permalink. 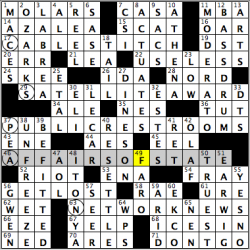 NYT: Given the theme, no way 55A and 66A should have that overlapping U. The constructor addresses this in his XWordInfo notes. He says he thought changing it would have made the puzzle less exciting. It seems as if many solvers didn’t pick up on this symmetry, which means it probably wasn’t necessary and the constructor should’ve just gone for the snazziest/cleanest consecutive letter entries possible. Still, really good puzzle, in my opinion. I wasn’t bothered at all by the extra U.
Whoa, totally didn’t see the symmetrical element to the puzzle. I don’t think Rex or Jeff saw it either, as neither mentions it. Very impressive from a construction perspective (though, I agree, not really necessary!). Definitely did not catch the symmetry. And agree it’s impressive but not necessary. 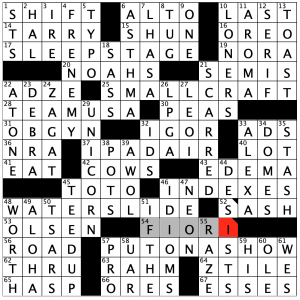 Xword Nation: Sports will make you smarter (addendum): C-SPAN’s coverage of the “ins and outs of our United states Congress” includes play-by-play coverage of an annual athletic contest – the Congressional Baseball Game. All the excitement of the Super Bowl without the commercials and without the half-time show. Jonesin’ – The Today’s Puzzles link to this puzzle isn’t working for me. I just get this error message: “The requested URL /Jonesin/jz190321.puz was not found on this server.” Just me? NYT. I think VCR is better for 67D than VHS, given the cluing. I understand the theme, but I don’t understand how the answer “go as you plea” makes sense for 34(A) clue, “copycat’s entreaty before a costume party,” The other theme answers make sense without the se for their clues. It’s a go-as-you plea, whatever that might be. Vaguely makes sense. More critically, I would like to mention the base chaise lounge versus chaise longue. Universal: Weirdly, and I’m assuming this is just coincidence, but there’s an “S” and “E” touching each other in proximity to all of the abridged them clues. Weirder still, for the first one, “SE” sits below it in a “curling” fashion. So I thought that all of them did that. Could have used some cleaning up.